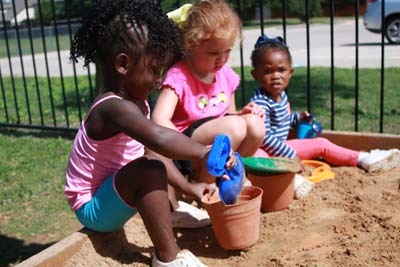 North Star Academy is a privately owned preschool that opened in the summer of 2006. From inception, we have dedicated our time as a management staff to continually seek the most appropriate teaching methods and learning environment for pre-school age children. In 2012 we were convinced that we needed to make changes to our 4 age specific playgrounds to make them more of a natural learning environment for our children. 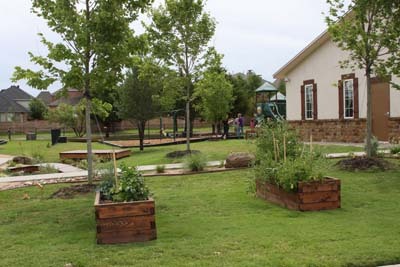 All of the design and building was completed in-house followed by landscaping provided by Brazos Tree Company and Hartwell’s Nursery. We unveiled our first round of natural updates to our families during a Spring Festival in 2014. 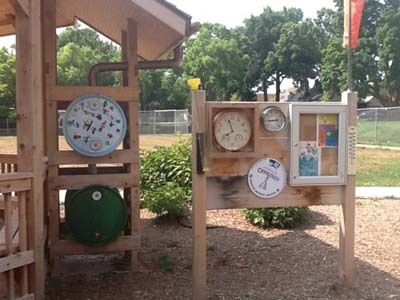 Today, at North Star Academy, you will find four age specific playgrounds that have been redesigned to include all of the aspects of a Nature Explore outdoor learning area. Nineteen new trees of varying species provide aesthetic beauty, a more comfortable space to play, and many different leaves and seed pods to investigate and use for art. Our toddlers send woodchips down funnels and ramps in their messy materials area. They love to dig in their digging pit, and play beautiful music with their drum line, bells, and chimes. Natural art can be found woven in the fence or on the toddler size art easel. Our toddlers also have plenty of room to run, ride tricycles, climb, and swing. Our two year olds favorite space is their digging area, where they play with buckets, shovels, and earth movers. They enjoy making music on a double octave marimba and dancing with streamers. 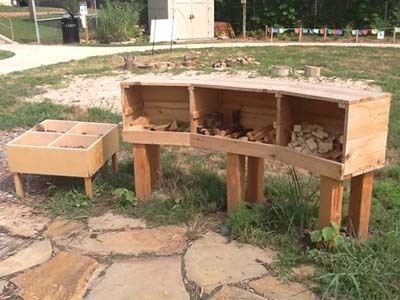 They also build with wooden blocks, make nature art, and explore our edible garden in addition to riding bikes on the bike path and climbing on the playground structure. 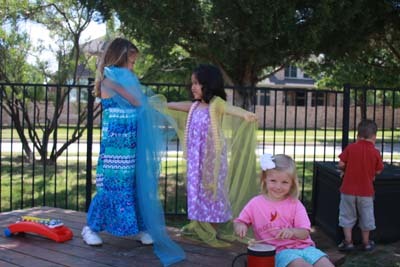 Our preschool age children give live music and dance performances on their stage using scarves and hand held instruments. They work hard, moving objects with wheelbarrows and have proven to be master architects with our loose materials. 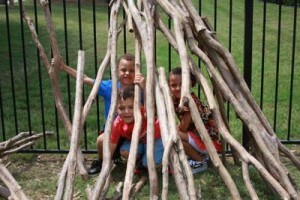 You may find a child balancing on a tree log, or propping several branches on the fence to make a fort. Another explorer may be at the nature art table making a beautiful design with seashells while her friend rolls a ball down a ramp maze in the building area. 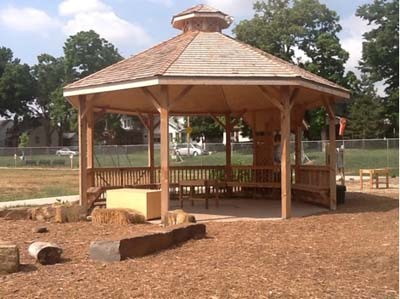 All of the learning centers surround a large play structure for climbing, and a large natural balance beam, and swings. Finally, our largest playground belongs to the Pre-Kindergarten and School age children. A large and busy group of children can easily spread out and find many things to do in this well laid out space. On the covered porch one can choose to build with tree cookies on our three level building table, read or do art at a picnic table, or play music on the homemade wooden marimba. It is an exciting day when paint filled spray bottles are brought out to the art stage where children can go wild on our double sided 12 foot long art easels. Two digging pits can be found in this space as well. One is filled with sand and dirt where many mud meals have been prepared, while the other has pea gravel that gets used in many excavation projects. Parents and teachers alike will be entertained by the many plays that are put on in the music and movement area on the raised stage with accompanying musical instruments. Entire villages have been built out of our plywood play planks in the open area. Finally, we have been most impressed with the imagination used to play with our loose materials. Tree stumps, tree limbs, rocks, and more have been fashioned into Restaurants, Stores, Vet clinics, and Indian camps complete with campfire, cooking area, tee pees, and more. 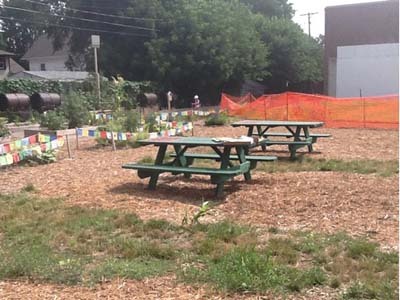 Three garden areas have been developed that can be visited by all of our children. 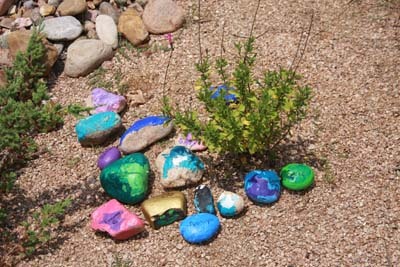 We have a sensory garden with a walking path, a dry river bed, and small bridge. It is filled with plants that have different smells and textures for the children to explore. We then have a butterfly garden where plants are chosen that will attract beautiful butterflies. Finally we have our edible garden where we plant fruits and vegetables that are cared for, harvested, and eaten by our students. We are so very amazed at the way our outside play has changed since adding the nature explore learning areas into our playgrounds. We vow to continue the transformations of these playground spaces, always looking for new and exciting ways to engage with nature.